The dock in Flensburg where the ship will be built. IRISH FERRIES IS getting a new €144 million ferry that will serve passengers on routes from Ireland to Britain and France. The ferry is to be built in Germany by manufacturer Flensburger Schiffbau-Gesselschaft and is scheduled to be delivered in May 2018. 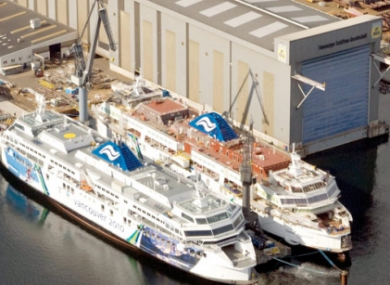 The Irish Continental Group announced the purchase of the new vessel this morning, saying that it will likely be introduced on the routes currently served by the Irish Ferries ship Epsilon. Epsilon currently travels between Dublin and Holyhead on weekdays and operates on an Ireland-France route at weekends. The 50,000 tonne ship will have room for 1,885 passengers and crew as well as about 1,216 cars. There will be 435 passenger cabins on board. The ship will be powered by four engines that ICG says will be designed to allow for environmental fuel efficiency. It will also be built to navigate through sea ice to allow for a wider geographical area of operations. ICG’s CEO Eamon Rothwell says that the vessel will “deliver a much enhanced onboard experience for all customers”. We also expect to be well positioned to accommodate the changing expectations of our customers, and to benefit from significant operational and financial benefits following the delivery in 2018. ICG says that that the ship will be paid for in installments totalling 20% before the 80% balance will be paid upon delivery. Email “Irish Ferries is splashing out on a new €144m ferry”. Feedback on “Irish Ferries is splashing out on a new €144m ferry”.